For the 4th year in a row, we created a team with the main mission to raise money to help eliminate hunger. Walk to End Hunger is an event that benefits 15 different hunger relief organizations, all working within Minnesota. According to their website, 1 in 5 families with children struggle with hunger issues in MN. We truly believe this is a problem that can be solved if people get involved. 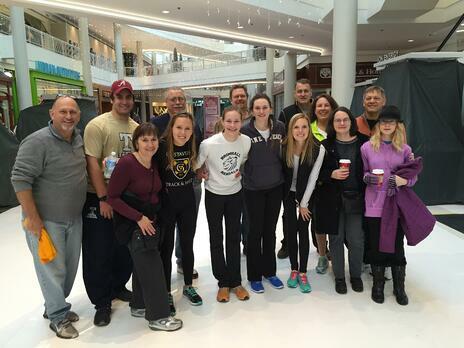 Our team, "In Harms Way" had 14 members that each walked 5K at the Mall of America. The younger members also participated in the "Break a Sweat" stations to get a better work out. We exceeded our goal by raising $600. The first floor featured music, balloon animals, Santa, and a kids craft table. You could join Bodies by Burgoon on the second-floor route for a workout at your own pace on your own or with your family. There is no better way to start Thanksgiving then giving time and money to a great cause, in addition to wearing off those calories before the big feast!